Before the Snow Autumn Tree Watercolor – Let's Paint Nature! Today this tree is covered in white. It looks nothing like this painting. Perhaps there are a few less leaves as well after a gusty winter storm arrived in Chicago yesterday. It is perceived differently today than it was when it was not dressed in white, sporting gorgeous colors. But it is the same tree. Why do I paint so many trees? Because they’re all so different. Each one, unique. Even when I view the same tree in a different manor, a whole new world opens up. 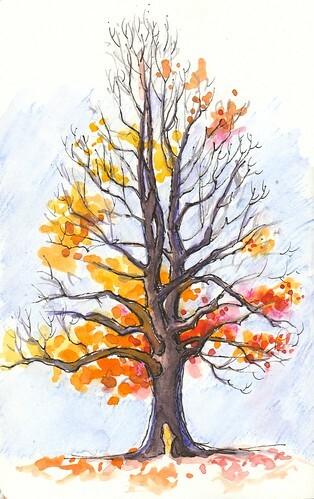 For this tree I used traditional watercolors and watercolor pencils. The background sky is watercolor pencil and also the fiery crimson color in the tree. The crimson gave it just enough punch to make the whole tree stand out. Here is the full painting. Another perspective, looking totally different than the first but the same tree. How can we look at nature differently? Can we get a different perspective? The bottom of this tree had a fresh cut in its trunk. There was water near by, so perhaps this was the beginning of a beaver chew. Interesting fact about beavers… the reason why their front teeth are orange is because they have a layer of iron, giving them the strength they need to chew through trees. Fascinating! Back to perspective. If you’re are artist hiking in the woods on these gray winter days, in a creative slump, try to look at things differently. Zoom onto something and inspect it. Take a small chunk of a big picture. You’ll see things differently and have your inspiration in no time. ← Let’s Draw a Rabbit (for kids and adults who want to have fun)! Gorgeous. We have just entered into my favorite tree season: when you can see the structural shapes of the branches. Also, the misty mornings and soft gray trunks, blending into the mist in the distance. Love the colour orange and thanks for the beaver fact! Your painting captures a moment that will never be again! Love the way you’ve spread out the leaf clusters– lovely, Christine!